Former Massachusetts Governor Mitt Romney greets supporters before announcing he is running for president today. JUST AS MITT Romney declared today that he’s campaigning for the Republican Party nomination for next year’s US presidential election, it looks like he’ll have more company in the push for nomination. While Romney made his candidacy official in New Hampshire, political heavyweights Sarah Palin and Rudy Giuliani caused a stir of their own with visits to the first-in-the-nation primary state. And rumblings from Texas Gov. Rick Perry, New Jersey Gov. Chris Christie and Rep. Michele Bachmann of Minnesota further undercut Romney’s standing as the closest thing the GOP has to a front-runner. “I’m Mitt Romney and I believe in America. And I’m running for president of the United States,” Romney said to cheers on a sunny farm here in Southern New Hampshire. The former business executive previewed a campaign message focused on the economic woes that top voters’ concerns: rising gas prices, stubbornly high unemployment and persistent foreclosures. It’s a pitch tailored to the conservatives who hold great sway in picking the GOP’s presidential nominee in Iowa and South Carolina — and the independents who are the largest political bloc in New Hampshire. And it is as much a statement on his viability as it is an indictment of Obama’s leadership. Romney comes to a presidential contest that lacks a true front-runner. In the last week, the still-forming field became less certain with Giuliani visiting an Italian restaurant here and meeting privately with state activists. In North Conway, Giuliani said he hasn’t decided yet if he will run again and that he expects to make up his mind by the end of the summer. But he certainly sounded like a candidate, telling reporters that the nation is being led in the wrong direction by Obama. Palin, her party’s 2008 vice presidential nominee, was set to arrive in New Hampshire later today for appearances that highlighted her potential to upend the race should she run. Aides weren’t releasing her schedule, but her family’s bus tour that rumbled out of Washington last weekend was likely to overshadow the declared candidates. Perry, too, gave hints he was considering a bid, though his aides sought to tamp down expectations he would join. Tea party darling Bachmann is inching toward a run, perhaps giving the anti-tax, libertarian-leaning grassroots movement a candidate to rally around. 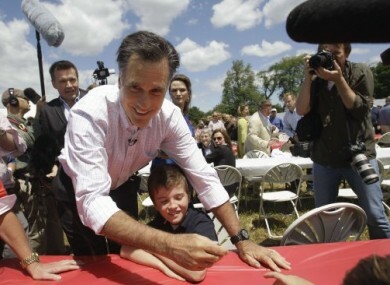 Romney’s strengths are substantial: He’s well known and he’s an experienced campaigner. He has a personal fortune and an existing network of donors. He has a successful businessman’s record. But his challenges are big, too. They include a record of changing positions on social issues including abortion and gay rights, shifts that have left conservatives questioning his sincerity. He also has struggled to allay some skeptics of his Mormon faith. Romney oversaw a health care law enacted in Massachusetts that’s similar to Obama’s national health overhaul, which conservatives despise. Asked about how big a problem Romney faces regarding the Massachusetts health care law, Giuliani was critical. Email “Mitt Romney declares bid for US presidency ”. Feedback on “Mitt Romney declares bid for US presidency ”.